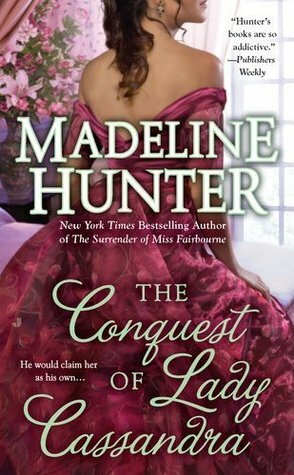 Someday I’m going to read one of Madeline Hunter’s series in the right order. I somehow managed to pick up #2 without having read #1, which I intend to rectify. This one rates just below average for me for a lot of reasons — and it isn’t even that it’s a bad book. It’s just that it left me unfulfilled. I initially gave it a solid 3 stars, but I keep thinking of more things I disliked about it, so I had to knock a bit more off. The biggest problem is that I just don’t believe in this as a love story. It’s an interesting story, but not a believable romance. I believe that Yates and Cassandra feel attraction and friendship for each other. Once they get over a variety of trust issues, they seem to know how to communicate with each other. But I don’t believe that they feel abiding passion or deep love. The story just plain never gets us there. The heat is sexual but not emotional. Theirs will be a really good marriage of convenience — but it still feels like just that. Hunter never manages to elevate them beyond that point. The title is also misleading. There’s no conquest. Neither Cassandra’s physical nor emotional self is at any point overthrown. She makes a logical decision to preserve her aunt’s future, and she chooses Ambury as the lesser of two evils. It’s all very cerebral, very detached. I also had issues with some unanswered questions, and while I freely admit some of that might be due to missing the first book in the series, I really doubt all of it is. Ambury’s motives throughout are somewhat vague and mutable. We never really get a good idea of what he does in his moonlighting as an investigator — how long he’s been doing it, how it makes him money, what other cases he’s taken — it’s just sort of a slapped-on detail, not a fully realized character point. The information about Cassandra’s past is sort of annoyingly withheld until very late in the book, and the last-minute turn just seems odd and out of place. None of that is to say the book is without its advantages. I actually enjoyed the process of reading it, and got through it quickly. The story is compelling — it just isn’t what’s on the tin, you know? Watching Yates and Cassandra negotiate around each other, around their friends, around her brother, is all interesting. I like the slightly different setting (though the publishers need to know not to refer to something set in 1798 as Regency) and the sociopolitical spin that puts on things. And I’ll definitely be picking up the rest of the series, because I generally like Hunter’s writing, and I especially like how she interrogates what romance does to friendship. Not a lot of romance authors do that, even if they’re using the conceit to string together a series. Hunter’s romances, on the whole, seem more grounded in reality than others in the genre — which sometimes works for me and sometimes doesn’t. After all, this genre is generally a fantasy as much as anything involving dragons or magic. I was looking for a comprehensive yet readable military history featuring the Roman legions, and Dando-Collins delivered. 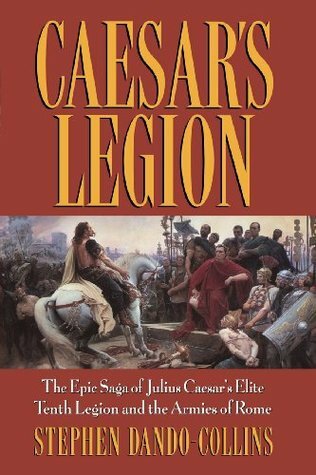 This book (more or less) follows the history of the famous Tenth Legion, raised by Caesar and present for most of the battles of his Spanish and Gallic campaigns as well as during the Pompeian War. Following Caesar’s death, they fought first for Antony, then for Octavian, and then fell into disuse in Syria. General Domitius Corbulo whipped them back into shape a few decades later, and they were instrumental in subduing the Jewish Revolts of the 60s and in taking the fortress of Masada in 73. Dando-Collins walks the reader through these events with vivid attention both to military strategy and to the daily life of the legionaries. Both are valuable to me — you get the big picture from Caesar’s viewpoint. 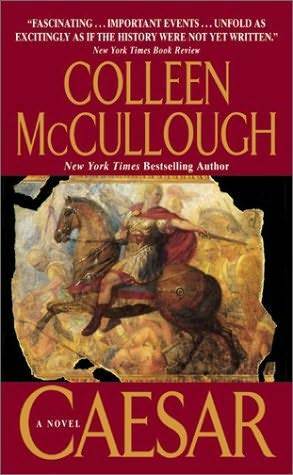 He focuses on some lesser-known battles of the Conquest of Gaul as well as the most famous, and does a particularly nice job detailing the end of the Pompeian Civil War, after Pharsalus. Most accounts just sort of take the attitude of, “and then Caesar left Egypt and mopped everybody else up.” This does a better job showing just how fierce the resistance continued to be, even with Pompey’s death and the capitulation of several other key Optimates. He seems to want to excuse the Tenth Legion from its mutinies where I’ve seen other writers come down pretty hard on them for turning on Caesar, attributing it to bad influence and a few corrupt centurions (rather than to a not-unreasonable expectation of getting paid). They manage to redeem themselves, though, and restore their reputations to one of honor and glory — just to sink back down again a few decades later. That in of itself is an interesting view of the Roman legions that we don’t often see. Mostly you hear about how they were the finest military machine the world had ever seen (I know some Parthian cataphracts who might wish to argue the particulars, but, whatever). We hear about the ones that get obliterated (Carrhae and Teutoburg Forest, for example). We don’t often hear about those that sink into idleness and ignominy. He also gives you both sides of Caesar — the truly genius military mind, but also the one slightly in over his head after the Rubicon, prone to errors that would’ve been uncharacteristic in earlier years. This book had two major drawbacks for me. One was Dando-Collins’s decision to replace Roman military rank with modern American military rank. Maybe it helps some readers, but for me, it just made it more confusing. I know what tribunes, legates, and proconsuls are, but I can no more decline the strata of modern major generals than I can perform integral and differential calculus The other was that this wasn’t really a history of the Tenth Legion. It was, in many places, a speculation on where the Tenth might’ve been and what they might’ve been doing, and in others, nothing to do with the Tenth at all. We spend a fair bit of time with the Sixth and the Thirteenth, for example, and a fair bit of time just unraveling political matters and personal vendettas. I understand that history leaves gaps, and that it would’ve been strange and jerky to leap from one event to another without explaining intervening matter, but then, why set that as your premise in the first place? Why not just write a comprehensive history of the civil war between Caesar and Pompey? Or of the evolution of the legions from late Republic into early Imperial Rome? It seemed strange to me to promote such a conceit when the actual narrative digressed so very often (even when those digressions were rather nice and things I appreciated, such as the chapter spent on the story of Germanicus and Agrippina). At least he admits when he speculates, though — it makes the reading a bit tiresome, with so many “if”s and “perhaps”es and “maybe”s littering the pages, but it bespeaks academic honesty. Dando-Collins has written another book, which does purport to look at the history of every legion. That one’s on my to-read shelf, so I’ll be interested to see how it compares. He’s also written a number of other Roman histories, and I like his writing style well enough to look into them someday. It’s accessible but not childish, managing to be comprehensive without drowning a reader in dense details the way many military histories do. I appreciate how often Dando-Collins refers to primary sources, which further enhances this book as good reading material for someone with an interest in not just the mechanics but the culture of the Roman legions. This is a strange little book, but thoroughly compelling. The narrator (who, as usual, resembles Neil Gaiman more than he doesn’t, though he confesses in the afterword that the familial circumstances are nothing like his own) is a middle-aged man returning to the village he lived in as a child, for a funeral. Wandering in avoidance of other people, he finds himself at the Hempstock house at the end of the lane, and remembers that, forty years earlier, a strange man committed suicide in a car there. The narrative then drops us back through the decades, where the narrator is a seven-year-old boy in a family facing financial difficulties and emotional tension. The stranger’s death sets off a strange chain of events, unleashing an eldritch creature who wants to destroy the narrator’s family and, perhaps, the world as we know. Standing between him and danger is Lettie Hempstock, who takes responsibility for him because, it seems, responsibility is a bit of a family trait. Lettie is eleven, and may have been eleven for a very long time. She has deep knowledge, considerable power of her own, and an utterly normal way of talking. She promises to protect the narrator, no matter what, and he thinks he’d die for her. Gaiman’s prose is, as ever, entrancing — elegant and brutal at the same time. He can paint you the mysticism of the Fae and a chillingly mundane reality in one smooth stroke. There’s a lot of power in juxtaposition. This book is, at its heart, a childhood fantasy — in the very least twee and charming way I could possibly mean those words. Horrors are everywhere when you’re a kid, and the world is so much bigger than you can possibly comprehend. So of course you wander off the path — if you didn’t, you’d never find out anything. The woods behind your house go on forever, and there really could be an ocean at the end of the lane, for all you know. And adults are mysterious, inexplicable creatures. Creatures who can be quite thoroughly menacing, because, as this book points out — and as too many abuse victims have discovered through the ages — they are large, and powerful, and who would ever believe a child with an incredible story? Even a child just a few years older than you are seems impossibly more skilled, an initiate into mysteries you know nothing about yet — but will, someday. It’s a terrifying way to exist. It’s a wonder any of us get past it, that we don’t just freeze up in anxiety and indecision and refuse to step either forward or back. And yet, for all of that, don’t you miss it? Not all the time, of course, but I think most of us have a little piece of our hearts that still yearns for the days when anything seemed possible, even if the anythings were horrible. A part of us that could still believe in the incredible, in such a primal way that’s hope and fear mixed together. We remember when the world seemed bigger, when more things seemed possible, when we hadn’t learned just how many limitations and constrictions the world will place on us, and we regret what age and experience have done to us, what they’ve taken away. Cynicism builds walls, makes your feet tread familiar paths. 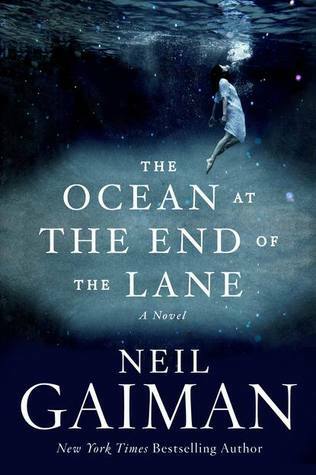 It’s this bittersweet nostalgia that Gaiman captures so beautifully, and that is the real genius behind The Ocean at the End of the Lane. I liked the idea of this book, and yet there are also a lot of fundamental ways in which I feel cheated by it. Bryan starts to create a pretty fascinating world (it’s yet another spin on Ye Olde Medieval Europe, but I’m perfectly willing to forgive that in a book if it’s handled with enough creativity) — but she never allows the reader to do more than dip a toe into the universe. The same goes for the characters. We learn about them, but we never get to experience deep emotions along with them. As a result, the whole endeavour just feels critically lacking in some fundamental ways. Okay. So. Lys (fantasy-France) is governed by a king, but since the realm is so de-centralized into numerous duchies, the real power seems to rest with various magical orders. The most powerful and prestigious of these is the Order of the Rose, which uses glasswork to form and shape magic. There’s a potentially cool mythology behind all of this — it’s pseudo-Christian, but slanted. The Young God defeated and bound the Serpent, with the help of the Magdalen and his Paladins, but somehow also died in the process (it’s a little unclear how exactly all of that went). The Paladins go on to found the aristocracy and also the Order of the Rose; the Magdalen is the first of the Ladies of the Isle (who seem to also be Order of the Rose, but not within its hierarchical structure). The book opens with Averil, who has been studying on the Isle, recalled to her duchy by her dying father. This happens amid rumors that King Clodovic has basically gone off the deep end and is making power-grabs, possibly using dark magic. Along the way, her path crosses with that of Gereint, a boy with unpredictable magical powers, raised in obscurity because his mother didn’t want to surrender him to any order. Their magic blends together really well, in ways that are apparently new and unheard of to the Order. Averil and Gereint both ought to be interesting characters. They fall into the typical fantasy trope of the princess and the farmboy, but that does not, in of itself, have to be a bad thing. Averil takes pride in her discipline and her learning, but there is wild magic surging up inside her, and so she gets a lot of conflict out of that. Or should. It’s more glanced at than really explored. Meanwhile, Gereint is so ridiculously powerful that he keeps accidentally blowing things up, so clearly something needs to be done to take him in hand. Unfortunately… no one ever really does anything. Members of the Order of the Rose just keep shuffling him off to each other, swearing up and down it’s because they know he has potential. We also learn a lot through observation rather than experience — Gereint will tell us what he’s learned about Averil by watching her, or guess at her moods, or just know something for no readily explainable reason. There’s a lot of telling rather than showing going on, which always disengages me from a book. The book also kept looking like it was going to do subversive things, so far as being part of the high fantasy genre is concerned, but then it shied away from them. The villain, for example — there’s actually opportunity for him to be really interesting. We get this chapter early on from his point of view, and it’s clear that he has some justification for his thought patterns. Because, yeah, it does seem like the status quo was stifling and stagnated, and in his own mind, he could really easily be a freedom fighter. 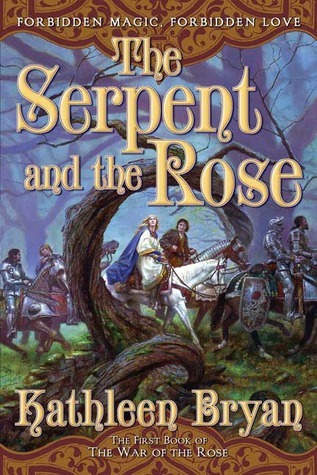 “Serpent” doesn’t have to automatically equal “evil”, after all — and so when Bryan started down that road, I was thinking we were going to get a more nuanced allegory, where the Serpent side of things isn’t Evil, just Chaotic, and so naturally opposed to Lawful/Order, and the story would be about finding balance between the two. But, no, all of that drops away, we never get to see things from his perspective again, and he ends up just being a generic Big Bad who’s throwing his power around because he can. And then there’s Averil and Gereint. I so wanted their story to be subversive, too, because they’re clearly thrust into this “our powers complement each other therefore we must be soulmates, but oh no, we are star-crossed because how can a duchess wed a lowly farmboy, woe is us!” thing. I kept waiting for them to, I dunno, not be in love with each other — to realise that, yeah, our powers work together really well, but that doesn’t mean we have to go all One True Love on each other, maybe we’re just destined to be really excellent coworkers. But no. Nothing unexpected there, which was a pity. It’s also a shame that, despite opening on an isle run entirely by female ages, it’s not very far into the book before Bryan removes from sight or just plain kills off all the other women, leaving Averil as The Chick. I’m growing really weary of the idea that there can only be one woman of consequence in a fantasy story. Overall, what I would say is that this book lacks depth. And in high fantasy, that’s a pretty big sin. Swords and sorcery alone doesn’t cut it any more. You need detailed world-building and complex characters. The Serpent and the Rose falls short on all accounts. It’s not bad — it’s just not particularly good, either. I might finish out the trilogy at some point, because I am afflicted with pretty acute curiosity when it comes to needing to know how a story ends, but I’m won’t be in a real rush. Spoiler Warning: It’s going to be very hard to discuss this book without significant spoilers. I will begin with a spoiler-free section (for this book, at least; it would be absolutely impossible to try and talk about this book without spoiling Cold Vengeance, so if you haven’t read that and intend to, turn around now), and then will have a clearly-marked spoilerful section beneath a cut. Read at your own risk. This book picks up immediately where Cold Vengeance left off, as Helen Esterhazy Pendergast gets kidnapped mere moments after being reunited with our beloved Aloysius. Despite a bullet wound, he takes off after her, following a trail south to Mexico — but when things take a turn for the worse, his quest eventually leads him all the way to South America, hunting down the neo-Nazi organization Der Bund. As I said in my Cold Vengeance review, Nazi themes really do nothing for me. P&C handle it fairly well, at least creating a somewhat plausible reason for a Nazi cell to have survived for decades without any intervention or investigation. And I did learn a few things about early German colonization in Brazil (which happened long, long before the Nazis — Brazil apparently wanted to attract new settlers so much that they were offering cash). Our familiar friends are out of the way pretty early, present for the New York half of the book, but absent when Pendergast goes abroad. His allies in Brazil, a local honest colonel and a cohort of hand-picked men eager to root out the shadowy Nazi organization lurking in their district, don’t offer much in the way of supporting characters, which is a shame. P&C are capable of creating really great secondary characters, but these guys ultimately felt a lot like Ned Betterton — superfluous and under-drawn. The pacing of this book is great, though. There’s no real lull in the action, and Pendergast’s emotional journey is as twisted as ever.For all that he’s brilliant and knows how to manipulate the feelings of others to get what he wants, he’s clearly never learnt to deal with his own all that well, but rather to bury them or dismiss them as illogical (there’s something a little Vulcan-esque about A.X.L.P. sometimes, really). It’s once again taking him far, far out of his comfort zone, into a place where his preternatural detective skills can’t actually fix everything, and I appreciate that P&C are willing to do that to their character. We also get to see more of Corrie Swanson in this book, which thrills me (it also reveals that, in-universe, it’s only been four years since the events of Still Life with Crows). I can see her going in a really exciting direction, now that she’s studying criminal justice. I wonder if — and hope that — P&C are grooming her and their readers to set her up as the next primary protagonist for the series. There’s also further development of Constance’s story (which is, if possible, even stranger than Pendergast’s). Two Graves is engaging and well-rounded without ever feeling over-stuffed. Spoiler Territory: From here on out, consider yourself warned. The significant spoilers start really early in this book, so some of this is discussing things that happen within the first 100 pages — but are still, I think, worth warning about. The rest, however, will go all the way through the end of the book and will discuss the trilogy as a whole. I’ve decided to review the first trilogy of this series all together, since the books are sort of too short to treat with individually. (Not that you couldn’t. It would just make for very short posts, and I’m more likely to complete one long one than three short ones). The Lord Meren mysteries are set in ancient Egypt, taking place during the reign of Tutankhamun. Each book has its own murders to solve, but they weave together into a larger political plot regarding the tensions of the time. These books posit Tutankhamun as the younger brother of the heretic Pharaoh Akhenaten (DNA tests in 2010 revealed him to be most probably Akhenaten’s son, but these books work from a different dynastic theory, popular and viable in the 1990s). Akhenaten had tried to turn Egypt into a monotheistic society, going so far as to construct a new capital for his sun god; though the kingdom reverted after his death, old tensions between the two factions persist in Robinson’s version of Tut’s Egypt. Lord Meren is “the Eyes and Ears of Pharaoh”, his chief investigator, who also bears the coveted title Friend of the King. Along with advisers Ay, Horemheb, and Maya, he works to keep peace between the court and the still-resentful priests of Amun, protecting the young king until he can grow into himself and govern Egypt with wisdom and strength. This is all, of course, very sad, since everyone knows that Tutankhamun dies at 19 — and if you know what happens between Ay and Horemheb afterwards, it’s even worse. That shadow hangs over the series, but not so heavily as to be a distraction. Robinson does a great job of evoking her setting. She has clearly done her research when it comes to Egyptology — there are so many wonderful cultural nuances, everything from dressing rituals to furniture to food. It’s both alien and familiar, as is entirely appropriate for a world removed from ours by several thousand years. People are people, on the whole, motivated by more or less the same desires throughout history — but the dressings change. The morality is different. The etiquette is foreign. But Robinson brings the reader through it deftly. Only occasionally do her explanations get a little too heavy-handed, and she does have a habit of repeating herself. 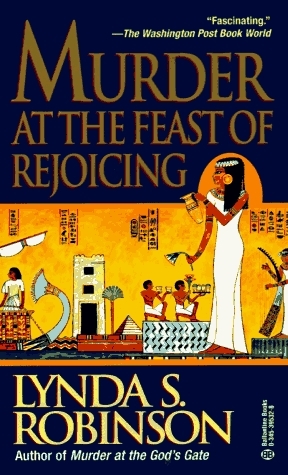 For the most part, however, she illustrates the world of the 18th Dynasty beautifully. She also handles the detective work nicely — an interesting feat without the benefits of modern science. A lot of what Meren does is simple deduction, or the sort of science that they had available to them (the Egyptians were, for example, experts on many poisons), but there’s also superstition and religion mixed up in it. For instance, when there’s a suspicious death, Meren brings in a priest to check for signs of magical interference. In this way, Robinson makes sure that the mystery-solving never feels anachronistic. Meren is a brilliant and capable man of his time, truly exceptional — but he remains a man of his time, not apart from it, which I appreciate. All three books have snappy, quick-moving plots. 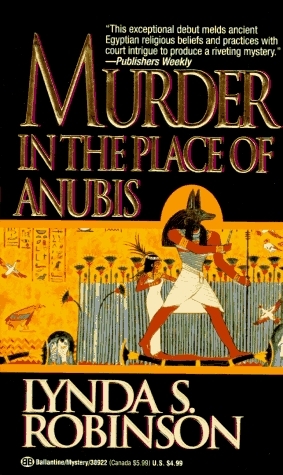 In Place of Anubis, a man is killed in the sacred place of embalming, and his wife, sons, concubine, and coworkers all seem to have reason to have done it. In God’s Gate, one death, made to look like an accident, sets of a chain of murders pointing at a conspiracy among the priests. In Feast of Rejoicing, Meren’s cousin-by-marriage dies at his house, forcing him to examine his own relatives as potential suspects, all the while trying to protect his teenaged daughters from harm. Throughout all three, another mystery surfaces: the fate of Queen Nefertiti, assumed to have died of plague — but Meren comes to suspect it may not have been so simple a tragedy. He also has to work to keep the young king Tutankhamun sheltered, but without hobbling his growth as a ruler — and he has to help the king protect the mummified remains of Akhenaten, the very pharaoh who caused so many problems for Meren. Lord Meren, his adopted son Kysen, and his daughter Bener (introduced only in the third book) are the best things about this series. They’re wonderful characters. Meren is haunted by the past, both by his own capitulation to the blasphemy of the Aten and to his role in Akhenaten’s death (a sin of omission more than anything else, but still a source of guilt for the honorable Meren). Akhenaten had Meren’s father killed, then imprisoned and tortured Meren into accepting his new god; during Akhenaten’s reign, Meren had to bear witness to all sorts of fits of madness, blasphemies, and desecrations, and he has never been able to forgive himself for being party to it. Akhenaten was also responsible for the murders of the wife and child of Meren’s cousin Ebana, a priest of Amun, causing lasting tension between them. Meren also has a jealous younger brother who was spoiled by their abusive father, a sly former friend and potential lover called Bentanta, a host of meddling relatives, and three daughters growing up too quickly for him to handle. Bener, the middle daughter, is fiendishly clever, with a tendency to buck proper gender roles in an attempt to help her father. Kysen was adopted by Meren as a child, plucked from his own abusive father, lifted from a commoner’s life to the glories of the court, and never quite comfortable there. He follows in Meren’s footsteps, learning the methods of detective work and interrogation, helping Meren to piece together the puzzles. Together, they make an intriguing and complex family. 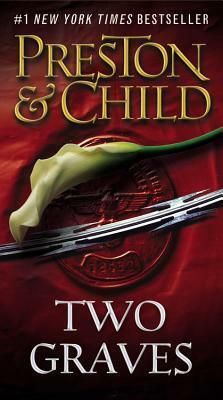 I can happily recommend these books to fans of murder mysteries and historicals. I read them first when I was about 12, and I return to them every few years, just as light, easily digestible summer reads. They aren’t particularly deep or complex, but they are well-rendered, engaging, and well worth spending a few hours with. I would also recommend them to anyone who enjoys the Pendergast novels (as many of my followers do). There are some similarities between Meren and our beloved Aloysius, and the tangled family dynamics twisting into the murders has a similar appeal.